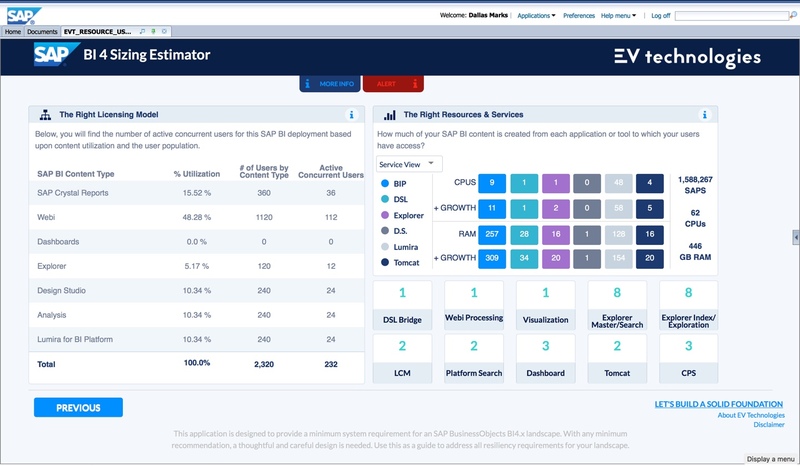 SAP BI4 Sizing Estimator - EV Technologies, Inc.
One of the historical best practices for SAP BusinessObjects BI4 sizing has been to use the SAP BusinessObjects BI4 Resource Usage Estimator. It works by making guesses about the number of active concurrent users of Analysis OLAP, Crystal Reports, Dashboards (formerly Xcelsius) and Web Intelligence. 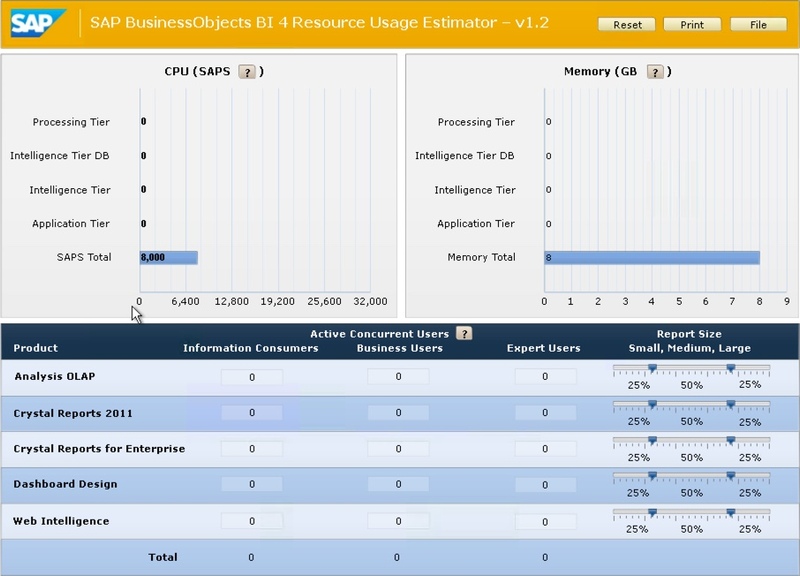 The Resource Usage Estimator has a couple of key limitations. First, it was built using Xcelsius, meaning it was built in a time before SAP BusinessObjects Design Studio and Lumira even existing and omitted Explorer sizing calculations. Second, it provides no insight into your current system usage patterns, therefore the values entered for are (highly educated) guesses. 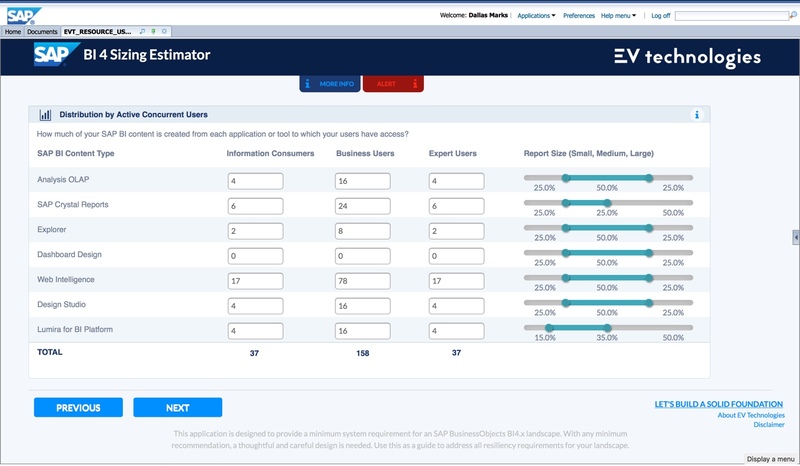 To overcome these limitations, EV Technologies has created the SAP BI4 Sizing Estimator. First, we built it on a modern foundation – SAP Design Studio. Next, we crafted algorithms based on official SAP sizing guides for Design Studio, Explorer, and Lumira so final sizing numbers reflect ALL content types. And we added options for SAP BW, multi-source universes, 24×7 up time (redundancy for fault tolerance), and estimated annual growth rate. But the most significant innovation is the use of existing usage statistics, obtained by Sherlock® as part of our customer assessment process. Sherlock® knows exactly how much you use each content type. And it knows how many users are concurrently accessing your current system. So instead of spending hours in analysis and manually entering data, Sherlock® spends minutes (typically around 90-120 minutes) in analysis and automatically populates the sizing estimator’s initial inputs. Just like its predecessor, we allow the sizing to reflect different user types and content sizes. The result? A fact-based SAPS rating and RAM calculation that takes into account all of the significant factors that can influence sizing. The CPU and RAM breakdown can be viewed according to application (content type), as shown below. Or the CPU and RAM breakdown can be viewed according to service view, so you know how many of each major service should be deployed. The SAP BI 4 Sizing Estimator is an exclusive offering of EV Technologies and is just one of the tools that we use to minimize risk and maximize success whether you are migrating from XI 3.1 or updating an older BI 4.0 or BI 4.1 installation. And there’s no cost to run the zero footprint edition of Sherlock® for a one-time system inspection. 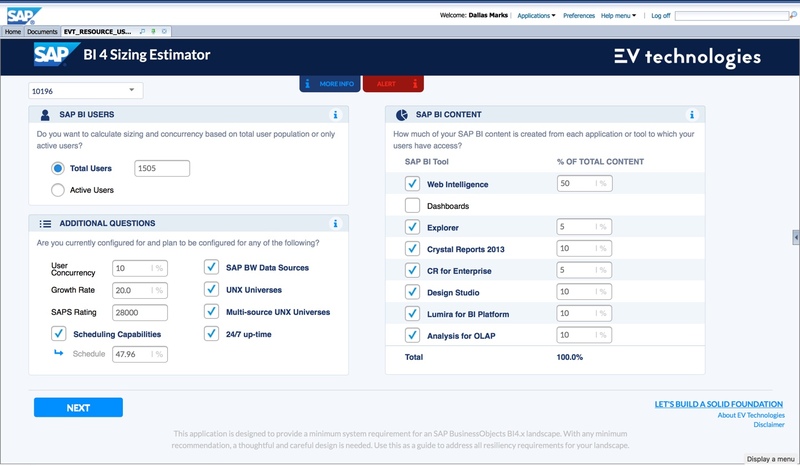 Whether you’re migrating to the BI4 platform for the first time or upgrading to BI 4.2 from a previous version, our SAP BusinessObjects BI Sizing Estimator can make sure that your system is ready for your toughest analytics challenges. Want to see our sizing estimator in action? Contact us now!